Anyone who has ever worked on a hazardous job site knows you need gear that's specialized for your exact task. Dangerous gases and chemicals can be present in a variety of scenarios, from oil rigs, to silo's, to utility plants, and the margin for error in your electronic devices is near zero. That's why we carry a wide range of flashlights that are independently certified to be intrinsically safe when used around combustible dusts or reactive vapors. Industry-leading brands like Pelican, Streamlight, and Underwater Kinetics pride themselves in building tough, reliable flashlights that can be counted on by those who need to know they have the best. 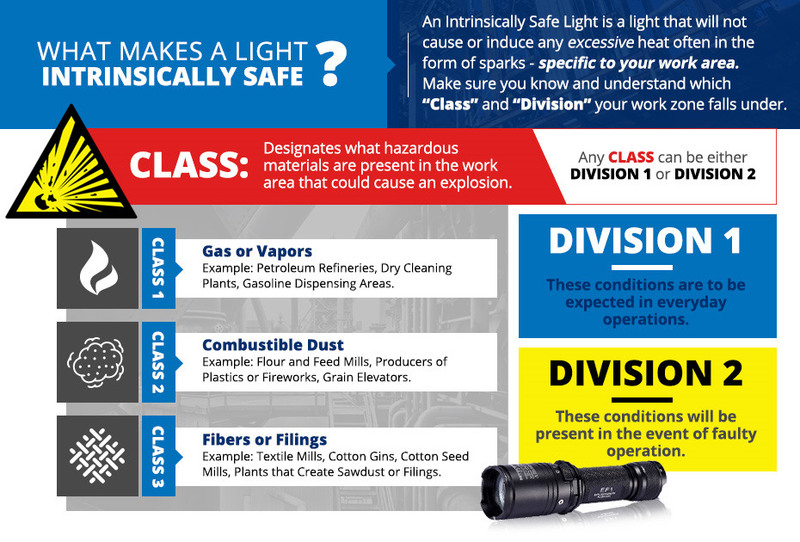 The lights listed below are all Class I, Div I or Class I, Div II certified, meaning they're safe to use near flammable gasses, vapors, or liquids. Div I certification means the lights are safe when those chemicals are present all or some of the time under normal operating conditions. Div II indicates the light is safe when flammable gases, vapors, or liquids, may but are are not likely to be present.